Ice Facials | The Celebrity Beauty Secret for firm, healthy skin. Ice therapy is an amazing beauty secret. A bunch of celebrities finish off their facial cleansing routine by dunking or splashing their face with ice water. Pharrell Williams says that he finishes off his cleansing routine with ice cold water because his big sis Naomi Campbell taught 'em. Her super model counterparts like Kate Moss and Linda Evangelista were also fans of using ice water before photo shoots and runway appearances to create firm, healthy skin. We've talked about the wonderful beauty benefits of taking cold showers. I've even discussed how I used hot and cold water therapy to treat facial blemishes. You can imagine my excitement to learn that there's actually a facial tool that uses the power of ice to enhance the look and feel of your skin. 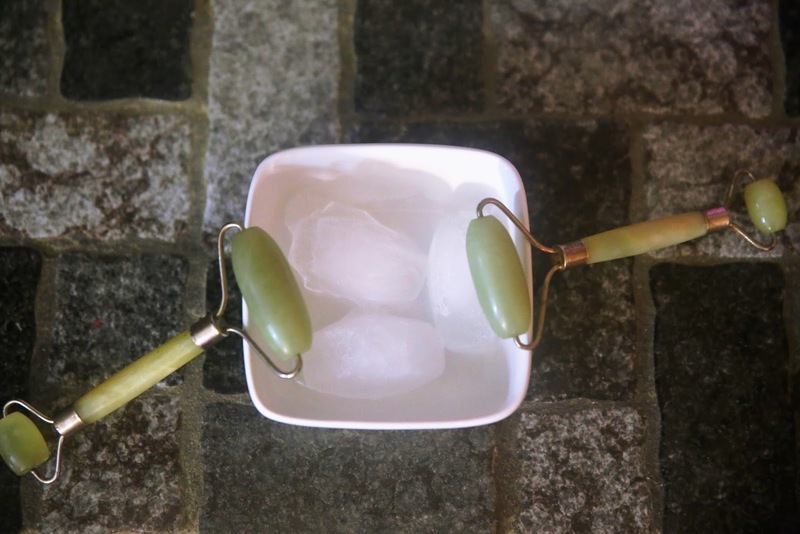 Ice facial rollers are handheld tools that live in your freezer! The roller head is filled with water and gel which retains the cold temp as you roll it across your skin. A facial ice roller has so many applications. You can use it to close up the pores after cleansing. Cold temperatures fight inflammation which is great if you have acne breakouts. Another great use for the roller is after any treatment that causes irritation to the skin like using a derma roller or after a laser peel. The cooling feel of the ice roller will calm your skin, helping it heal faster. I was moments from buying this ice roller when I remembered that I had a couple of jade rollers to experiment with. I grabbed two rollers, rinsed them with water and placed in the freezer (while still wet). An couple of hours later, hubby snuck up on me and rolled one on my back. Not realizing what it was, I jumped back, startled and partially annoyed. But once I realized that my jade roller experiment worked, I was elated! Since he was confused as to why they were in the freezer in the first place, I explained my experiment as I tested the roller on my skin. Success! The roller felt just as cold as if I were rolling an ice cube on my face, but without the messing dripping. Since my roller isn't made of the same material as the professional roller, the cold feeling lasted for only about a minute before I had to remoisten and place back in the freezer. For a few minutes after use, I could feel the lasting effects on my skin as the warm blood rushed back to my face. As you might recall, cold temperatures on the skin cause blood to flow inwards towards the organs, as a protective measure. One the surface of the skin warms up again, the oxygen rich blood returns to the surface of the skin, giving it a nice healthy glow. Although, the jade roller hack works for now, I'd like to grab one of the ice facial rollers so I can execute longer ice massage sessions. 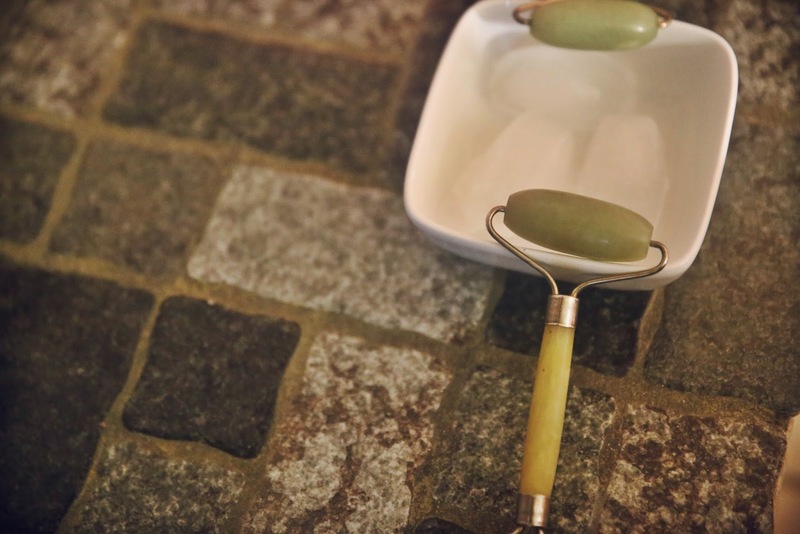 Even with a professional level ice roller, I'll still use the jade roller for dealing with under eye puffiness using the smaller sized roller. I remember the days when I'd put ice in a zip lock bag and rubbing it on my skin to enjoy the benefits. These rollers are so much more convenient and quite effective. This is a great idea! I've always used cold water to finish off my cleansing sessions. This just brings it up a notch! Where do you get the ice facial rollers? Thanks for sharing. Hi! You can find various types of facial rollers on Amazon. I was looking for articles on Best Facial in Dubai and I came across yours inspiring read. Great post!